Human began to use stone tools from Paleolithic Age, 2 million years ago. In the museum, the stone axes was for cutting animal meat or skin. 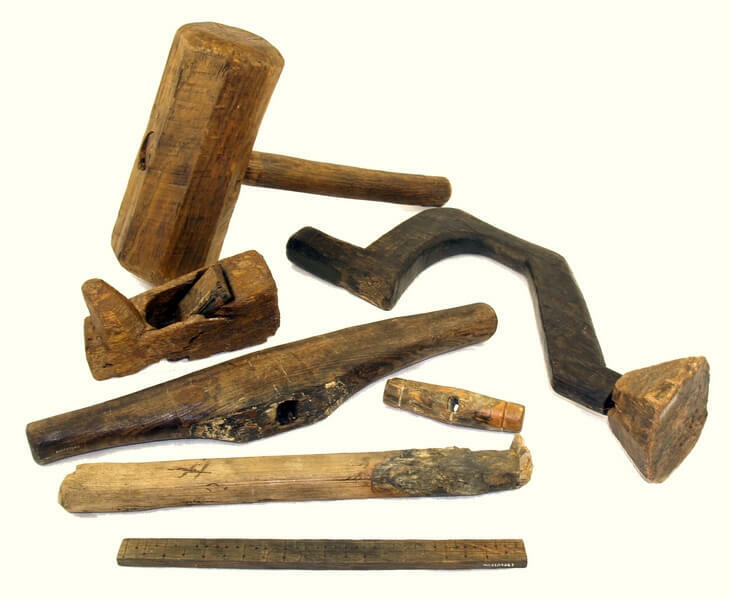 In ancient times, the bones was even applied as material to make needles and other tools. In the Stone Age, human know how to use fire. To transfer fire "security", human may use two bones to grip the fire. I guess, our ancestors should have found, in order to grip the heavy stuff, they use lever principle with less effort by tied the sticks together with rope as X-shape. This may be the first pliers. When talking about tools, we must mention its good friend, screws. In the ancient written record, the screws is mainly applied in pumping equipment. Later, it is largely applied into the combination or connection in Middle Age. At that time, the screw is already made by metal. To tighten the screw, tool is necessary. So wrench just show up in the history. However, the nut, the bolt and the wrench were invented at the same time, which means the size of the thread pitch, the nut head shape and size are inconsistent. This is very confusing. Using what kind of wrench or screwdriver to loosen the screw? Regarding this issue, every craftsman in that time are using destructive way to "loose" nut. Therefore, the failure rate is high when using the nut application. Various size of nuts chaos maintained a period. In the Industrial Revolution Age, finally we see the change. Industrial Revolution means the coming of mass production, and it also means the markets is on the way to international trade direction. The most importance of international trade is quality, called consistent. Without consistent, the products cannot sell to worldwide colonial market. The England people start to set up a standard of assembly screw/nut for their mechanical equipment, for the future easier repairing and maintainance. However, the private enterprise are not willing to share the specification to other competitors because of protecting their market. Then, the market in that period is full of various size/specification but different quality of screws, nuts, wrench and screwdrivers. After world war I, as the spare parts for weapon dimensions is inconsistent among the alleged countries, the parts couldn't be used among allies. It said this problem forced the international standard implementation. In this way, as the screws unify the specification, the normalization on tools is following accordingly. The glory of standard wrench and screw driver hand tools is starting to appear in worldwide market. Standardization, which means each national standard Inspection Bureau can take that specification sheet as reference. For example, in the beginning, Germany use DIN, but now European Union use ISO. America use ANSI, and Japan follow JIS. The specification in Taiwan is using according Japan/US. Being a profession hand-tool manufacturer, Tien-I produce complete ISO and ANSI specification for socket and impact socket and tube spanner tools. Metric or inch size, Tien-I can meet the required specification or even exceed. Just contact with Tien-I if you have any inquires.